Take lukewarm U.S. pork producer Smithfield. Slather with debt, remove from the market then serve up almost immediately in a Hong Kong IPO. To ensure the new listing comes out golden, add the secret ingredient: investor exuberance over Chinese consumer stocks. 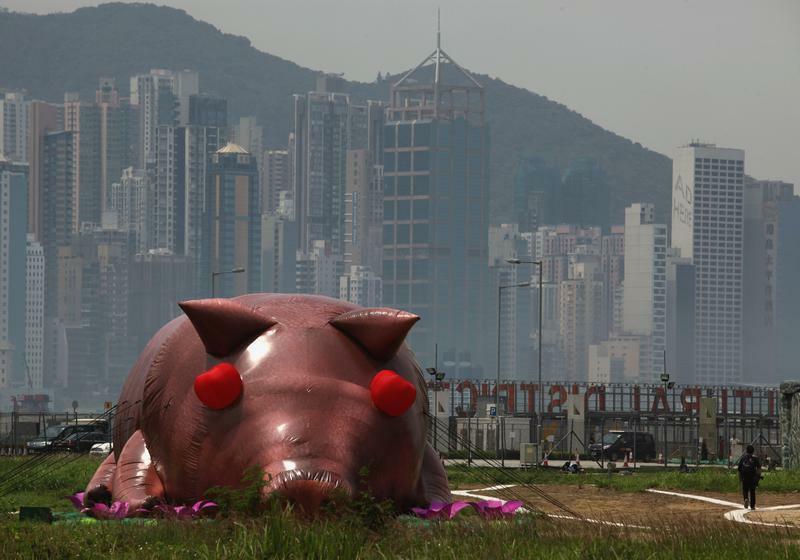 An inflatable sculpture "House of Treasures" by Chinese artist Cao Fei, which depicts a roasted pig, is displayed as part of an exhibition "Inflation!" at the site of an upcoming park in the West Kowloon cultural district in Hong Kong April 24, 2013. China’s Shuanghui International Holdings, which completed its acquisition of U.S. pork producer Smithfield Foods in September for $4.7 billion, has mandated six banks for an initial public offering. The size of the deal has not been set and may change. One banking source told Reuters that the IPO could raise $6 billion while another said it was more likely to be in the range of $3 billion to $4 billion. The news was first reported by IFR, a Thomson Reuters publication. The Hong Kong-based holding company owns a majority stake in Henan Shuanghui Investment and Development, which describes itself on a company website as China’s largest meat processing business. Shuanghui’s acquisition of Smithfield was the largest takeover of a U.S. company by a Chinese one. BOC International, Citic Securities, Goldman Sachs, Morgan Stanley, Standard Chartered and UBS have all been mandated to lead the initial public offering, according to sources. Shuanghui International is 33.7 percent owned by Chinese private equity group CDH Investments through several funds. New Horizon Capital, co-founded by the son of former Chinese premier Wen Jiabao owns 4.2 percent. Goldman Sachs has a 5.2 percent stake and Singapore’s state-fund Temasek owns 2.8 percent, according to filings. The remainder of the company is owned by employees, management, and various investment firms.